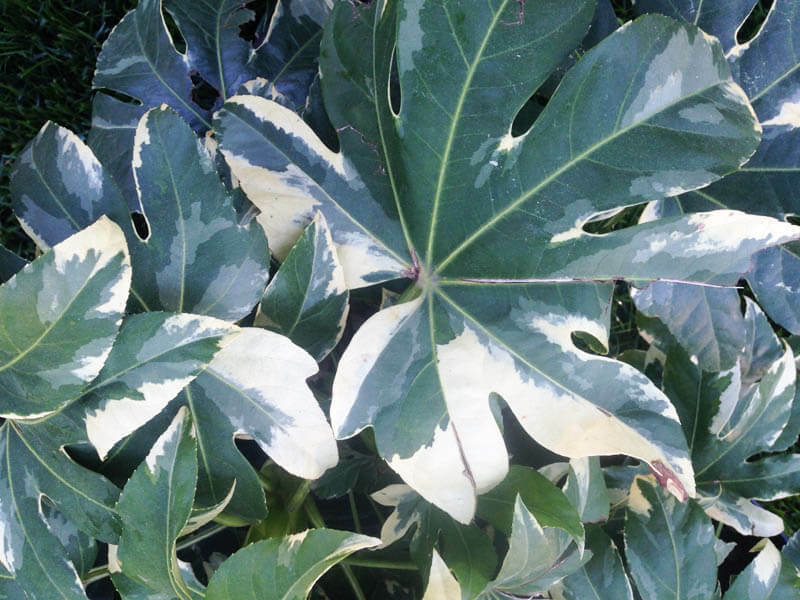 Variegated plants will add visual interest to your garden. 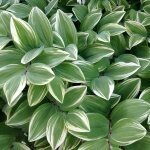 Here are just a few favorites to consider including in your landscape design. Polygonatum odoratum ‘Variegata’: Variegated Solomon’s Seal is one of the most brilliant plants for shade. Arching masses emerge with bold green and cream foliage that lasts until frost. The delicate bell like white flowers adorn this tough drought tolerant perennial in spring. 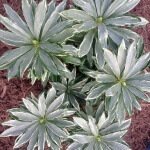 The gorgeous foliage contrasts well with Ferns, Hellebores, and Heuchera, making this a perfect choice for the shade garden. Caryopteris divaricata ‘Snow Fairy’: ‘Snow Fairy’ will brighten your border with variegation that lasts all season. 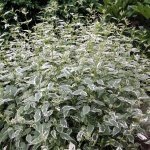 This mounding perennial reaching 4 feet tall and wide combines attractive green and white foliage with dainty blue flowers in late summer. It provides a reliable bold accent in sun to part sun. 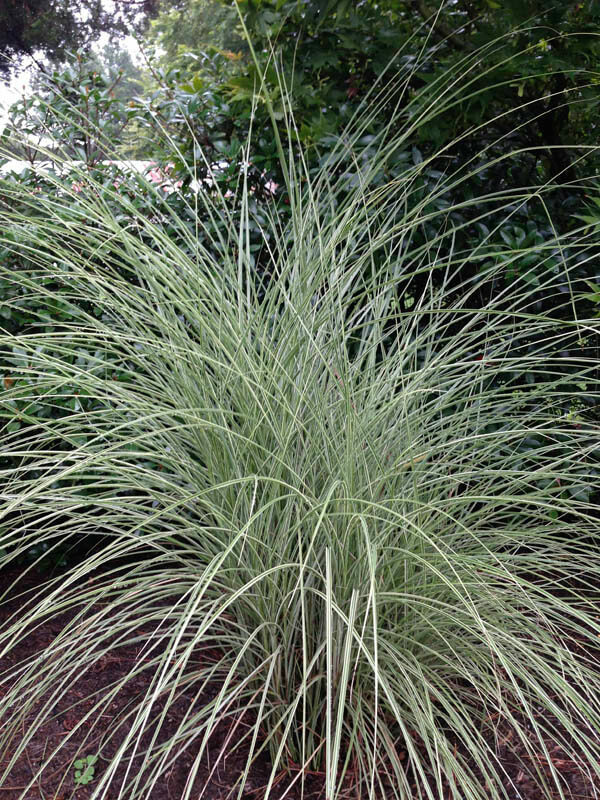 This shrub-like perennial looks great from mid-spring until the first frost and is drought tolerant and deer resistant. Daphne odora ‘Wild Winter’: This is a stunning new variegated Daphne discovered and recently introduced by local nurseryman Jason Stevens. The fascinating foliage is an interesting mix of green, blue-grey, and cream. Rose pink buds open to white fragrant flowers in February. It was discovered as a sport on the typical green Daphne odora. 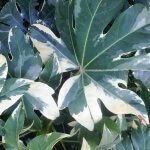 Fatsia japonica ‘Variegata’: Variegated Fatsia is the best tropical splash for the shade garden. 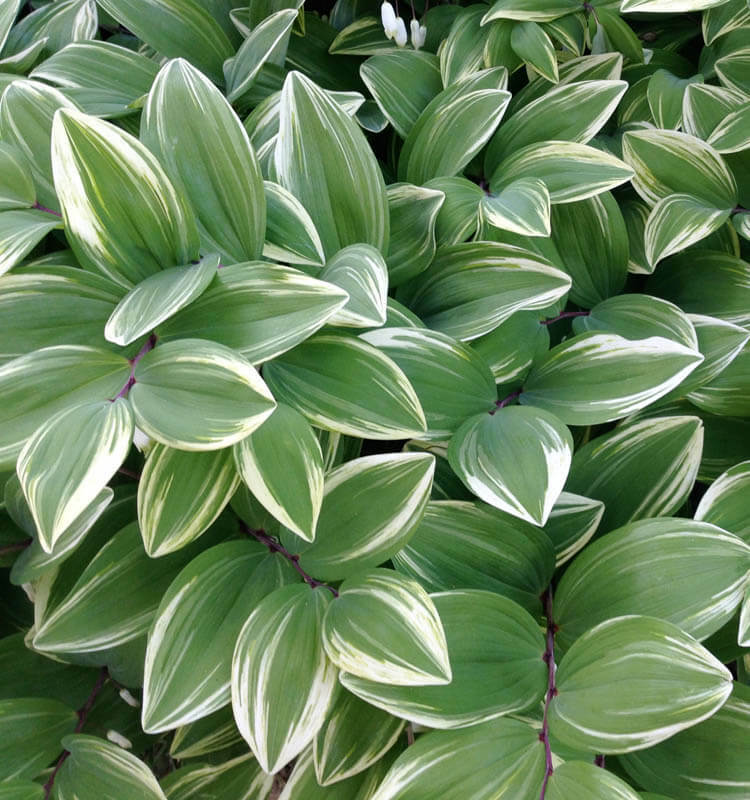 The large star shaped leaves each have an irregular pattern of green and white that layer together to form a spectacular 4 to 5 feet tall shrub. 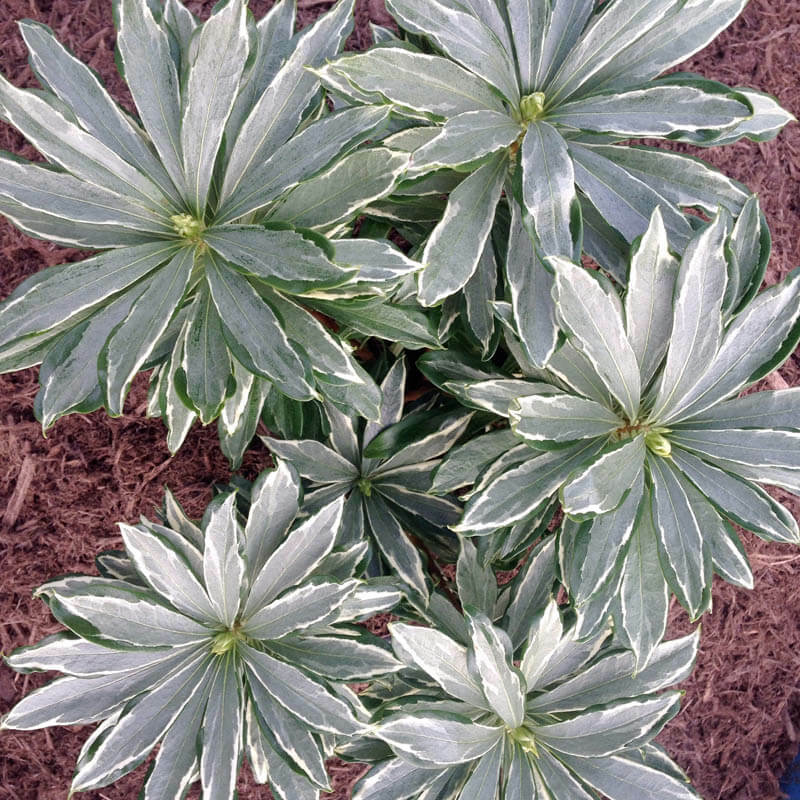 It loves the dry shade garden and will delight you in late fall with space age clusters of white flowers. This tough and dramatic evergreen is also great in a container. 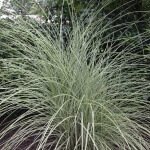 Miscanthus sinensis ‘Morning Light’: ‘Morning Light’ is a favorite ornamental grass because of the great form that brightens the garden. The narrow variegated blades stand upright in a graceful vase shaped form. By late summer the plant is topped with decorative plumes that last for months. This is the last grass we cut back in spring. In sun or part shade this is the grass that never flops and always looks great. 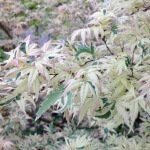 Acer palmatum ‘Butterfly’: ‘Butterfly’ is a small upright Japanese maple with delicate green and cream foliage that becomes sculpture in the garden. The soft bright leaves emerge in spring with rose pink highlights that continue to glow until fall. This small deciduous tree grows slowly reaching 12 feet tall in 10-15 years. The bright airy foliage lightens up the shade garden with a serene presence. Ilex x ‘Solar Flare’: ‘Solar’ Flare’ is an elegant gold-margined holly that performs well in our hot southeastern climate. 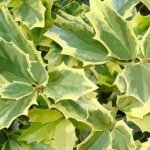 This variegated sport of the popular Oak Leaf Holly reaches 5 to 6 feet tall in 10 years and grows well in part to full sun. Each leaf has a bright gold irregular margin that surrounds a mottled blue-gray-green center. 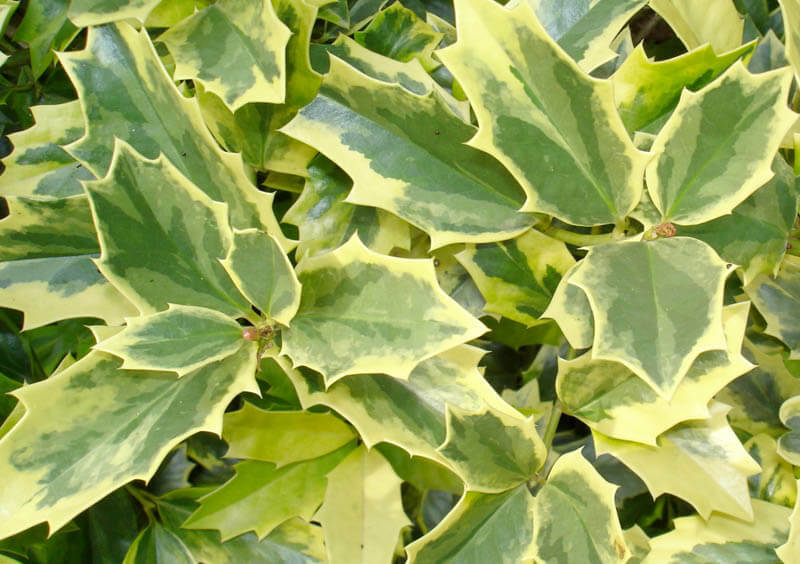 We discovered and named ‘Solar Flare’ and continue to find it a beautiful variegated heat tolerant holly. 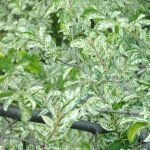 Ulmus parvifolia ‘Variegata’: The Variegated Lacebark Elm stands as one of the most elegant and ethereal trees I have ever experienced. Our original grafted plant came from Pat McCracken. Every spring it delights us with a cloud like canopy of delicate white patterned foliage. This fast growing tree reaches 30 to 40 feet tall with a rounded arching form. 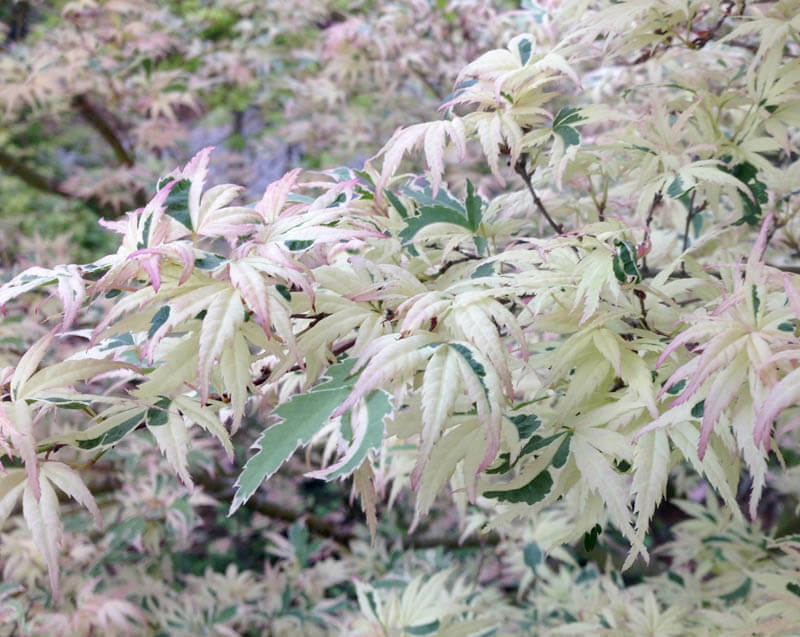 The intense speckled variegation on each leaf combines to create a floating cloud that rests over the garden. 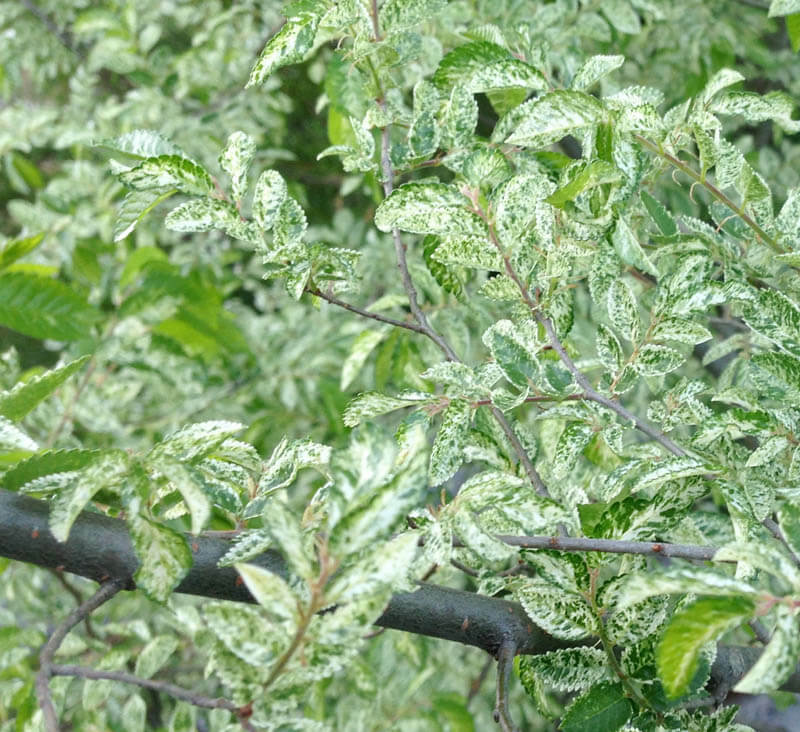 The Variegated Lacebark Elm is hard to find but the seedlings can resemble the parent and grow quickly. 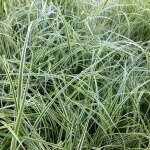 Carex oshimensis Everest: Everest is a new ornamental grass that is fantastic for the shade garden or containers. 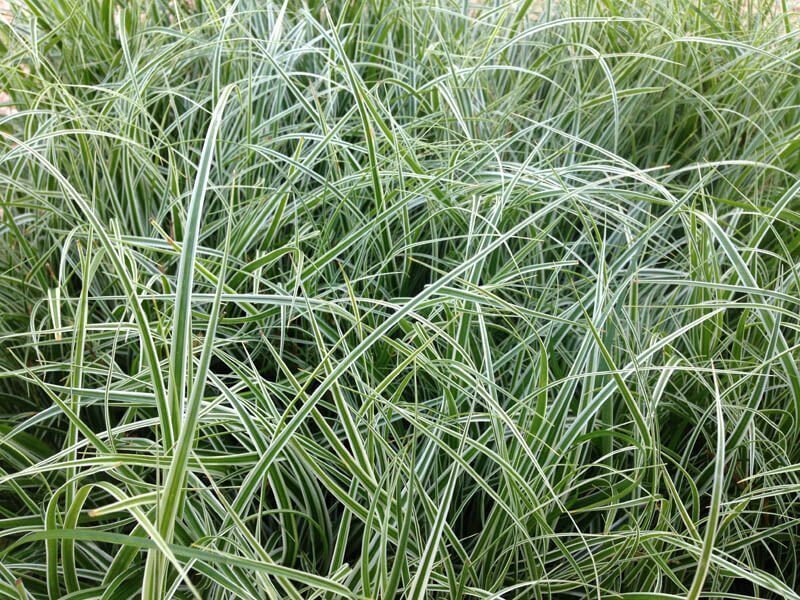 The blue-green and white variegated sedge sparkles from a distance and lights up the garden. This sport of ‘Evergold’ forms evergreen clumps reaching 1 foot tall and wide. Everest is drought-tolerant and deer resistant. 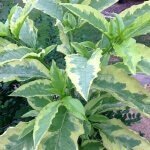 Phytolacca Americana: We found this variegated pokeweed in Johnston County about 10 years ago. 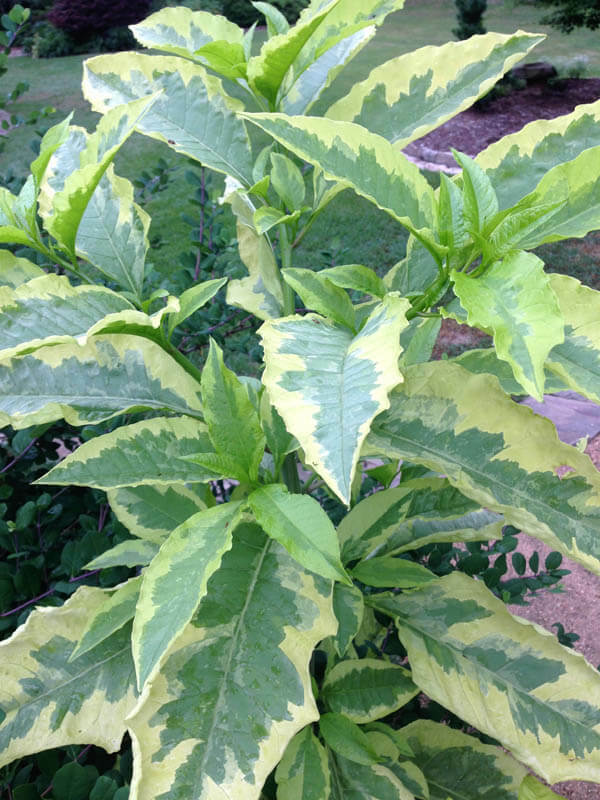 It is called a weed but this is one of the most interesting variegated plants in my garden! I have counted seven shades from green to gold in the center of each leaf and the bright surrounding margin. 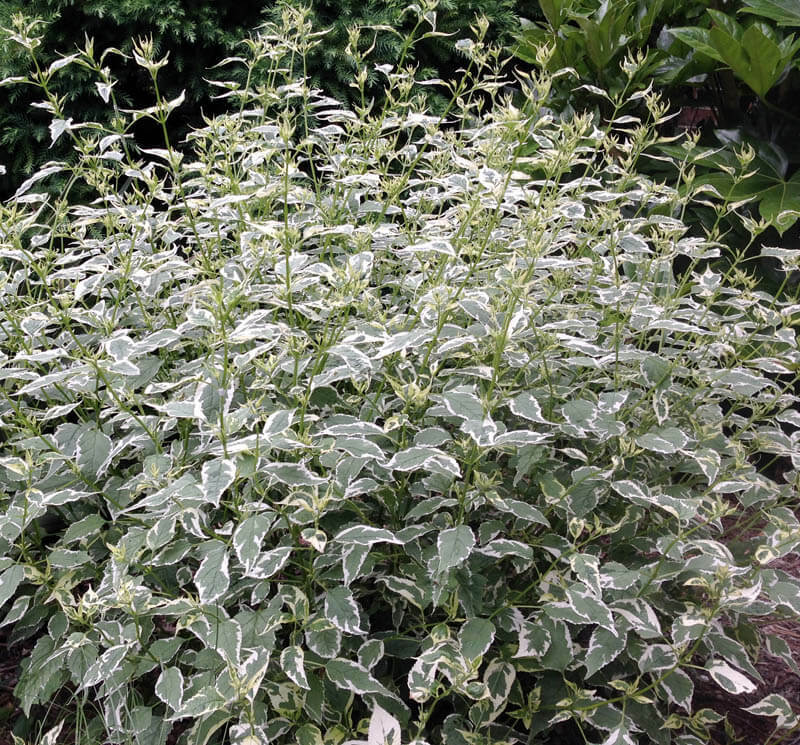 Tony Avent has introduced a variegated and also a gold cultivar that deserve a place in our gardens. Joann Currier gardens near Chapel Hill and is the owner of The Unique Plant, a specialty nursery. You can reach her at [email protected].